There is always something intriguing about a photograph like this;somewhat voyeuristic. And that light. You and your camera and that light...you just keep making magic. ..And a bench!.. I imagine an old school. Maybe I'm wrong. But that's where this picture leads my imagination to, at first sight. The simple themes of shape and light always seem to work best; nice shot. Everything about this photo is perfect! I love it! Beautiful capture. I swear I just love the way light plays through a window. You have captured it perfectly. This is gorgeous in its simplicity - and it draws me in to ask questions too - where is it? what's the bench? what's outside? Great stuff! Very well captured image...it's beautiful and nostalgic at the same time. Love the shadows. A photo to get lost in! It looks to me like a melancholy window. Nice moody shot! Nicely done, Clueless. Reminds me, for some reason, of an old school house. These kinds of shots always raise more questions than they answer...maybe that's why I like them. 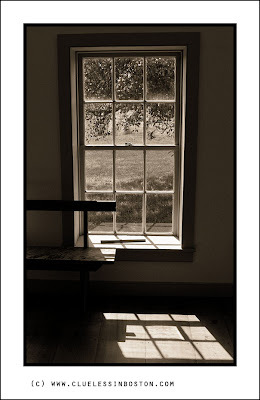 wow beautiful window!You did a great artwork in this post, I liked a lot the light and shadows, a romantic scenery. And yet,not everybody can render such perfection!